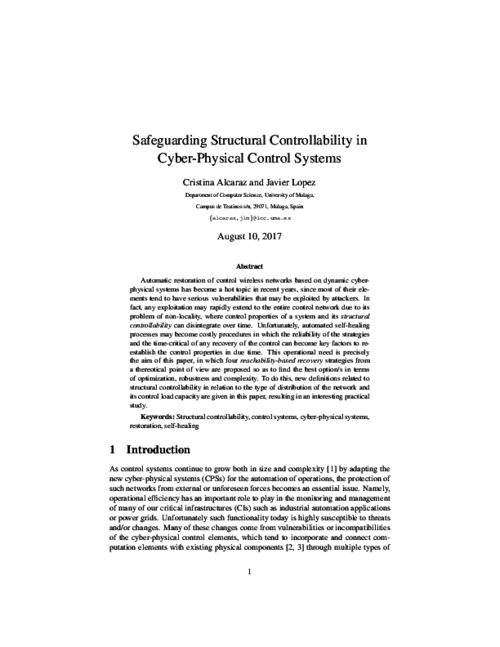 Safeguarding Structural Controllability in Cyber-Physical Control Systems | Network, Information and Computer Security Lab. Automatic restoration of control wireless networks based on dynamic cyber-physical systems has become a hot topic in recent years, since most of their elements tend to have serious vulnerabilities that may be exploited by attackers. In fact, any exploitation may rapidly extend to the entire control network due to its problem of non-locality, where control properties of a system and its structural controllability can disintegrate over time. Unfortunately, automated self-healing processes may become costly procedures in which the reliability of the strategies and the time-critical of any recovery of the control can become key factors to re-establish the control properties in due time. This operational need is precisely the aim of this paper, in which four reachability-based recovery strategies from a thereotical point of view are proposed so as to find the best option/s in terms of optimization, robustness and complexity. To do this, new definitions related to structural controllability in relation to the type of distribution of the network and its control load capacity are given in this paper, resulting in an interesting practical study.